So is walking your dog a pure joy? Or do you find yourself putting it off until you are racked with guilt and feel you just have to take her out? I absolutely, really and truly, know just how you feel! My dogs didn’t always walk like angels on a loose lead. I can clearly remember the times I stopped and realised with embarrassment that I had been shouting at them when they were pulling. I guess they thought I was encouraging them to go faster! So I decided to do something about it. Not yelling or cursing at them - they’re only being dogs. Like with almost every dog problem, it was me who had to change! It may seem counter-intuitive, but pulling on your dog’s lead is actually making her worse. It takes two to tango, and if you pull, she’ll pull. So, what’s the answer to this pulling question? Believe it or not, it’s for you to stop pulling. The reason dogs pull is because someone once followed them. Think about that one. From the moment you got your little puppy you let her tow you about on the lead wherever she wanted to go. I know - you thought you were being kind. But it wasn’t all that kind, as it taught your puppy something you didn’t like and wanted to change as soon as she got a bit of meat on her. The puppy pulls to the end of the lead. The owner’s arm floats up. Yay! Puppy has gained another yard! Then the puppy pulls harder and the owner takes a few steps behind her. Success! Got another three yards! So what has this puppy just learnt? Got it. She’s learned that if she pulls you will follow. DRUM ROLL ….. So from now on you are never going to follow your dog again. There is something called the opposition reflex. If you’re standing next to me and I pull your arm, you’ll pull back. You have to, in order to stay upright. If I pull harder, you’ll resist more strongly, and if I suddenly let go - you’ll probably fall over! You can see from this that pulling harder is not the answer. • To start off you need a proper lead - a six-foot one or longer. 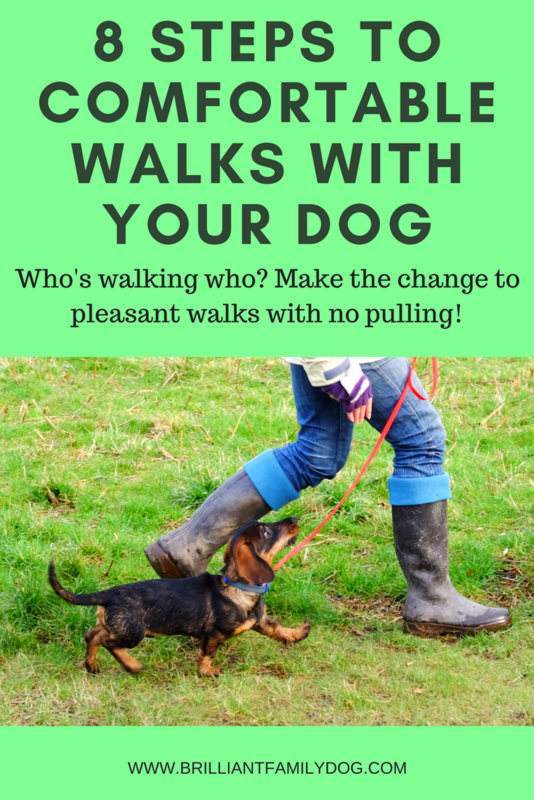 If you have a short lead your dog cannot help but pull on it as soon as she moves an inch from your side. This is even more exaggerated with a small dog who’s already at the full length of the lead just keeping his feet on the floor. So to achieve a loose lead you need one long enough to be loose. It should droop down in a nice floppy loop between you. • And when you’re holding that lead, you keep your hand close to you. Tuck your thumb into your belt if you find your arm floating up in the air. • You start out with your dog. She pulls to the end of the lead. You stop. You tuck in that thumb and keep your hand close to you. And wait. At some stage, she will stop pulling and look at you, wondering why you haven’t followed her as you are meant to. • As soon as she looks at you, you cheerfully say “This way!” and head off in the opposite direction. Now she’ll walk with you a couple of steps, and probably (if this has been her habit) surge forward to the end of the lead. • Guess what? Repeat Step 1. • You may walk these five yards quite a few times until your dog realises that something is new and different. She should by now be looking at you and wondering what on earth is happening. Fortunately dogs are very flexible and tend to take life as it comes. So if you’re consistent, she’ll accept that this is the new modus operandi and go along with it. • If you have two dogs, you need to walk them separately while you fix this. The first step is to stop the fight for possession of the lead. View your lead as your gentle connection with your dog. Like walking arm-in-arm with a friend. You need to change your perception of the lead as a controlling device and start seeing it as a connection between you and your dog. You are no longer having adversarial walks, but companionable ones. Try it then come back to me: what do you think? Let’s get your dog jogging nicely along beside you so that walks become a pleasure again, not a battleground. or just head over to Amazon, download it, and start straight away! There’s lots more you can do to build your relationship with your dog, and you’ll be reading that soon. As ever, the ways I suggest will all be force-free and pleasant for both of you. Don't go without checking out my new online Dog Training Course teaching new dog owners to achieve lasting results through six weeks of dog-friendly coaching - daily video lessons!